This is a painting I did a few weeks ago from a photo I took while staying on the Orkney island of North Ronaldsay. 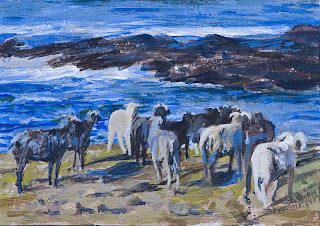 These sheep are deliberately kept along the rocky shoreline and have become adapted to a diet almost exclusively of seaweed. This is actually a small section of a much larger scene. I liked this little composition and there is enough here to convey what I wanted about this subject. I do use photos as a source for paintings but still have the nagging feeling that it's cheating in some way. I believe that in order to really improve painting skills it is essential to paint from life and I do this now as often as I can. I have recently bought a Pochade, which is a small portable painting box and easel which is ideal for doing quick outdoor oil sketches. I'm hoping to really get into using it this year and will post the results as I go along. I remember those sheep. They tasted very nice. Nice Pics Paul, when did you start painting again? Or ahven't you stopped? Yes they are tasty. Thanks Nick. I never stopped painting completely, but only painted very occasionally. Paul.